Late last week, I posted the details about the Rock’ing Challenge on reddit, and the post was pretty popular. That led AskMenUK to write up a story about it, summarizing the lengthy discussions that took place in the reddit comments. Where’s the faith, Rock? And to question me on a Leg Day no less! Even 4400 calf raises later, doubt remains? Granted I only possess two of those 4 requirements (I excel at cussin’), but then again, I am only doing this for a month. Of course, he did end it with the 100 emoji, which I’ll take as his full support for my journey. Thanks, Rock. I had a meeting in Times Square this morning. That involved an extra mile of walking, 20 minutes (roundtrip, so 40 minutes total) of standing on the subway, then walking to and back from the meeting. All of this adds up to another 400-500 calories burned, so I had a big day again when it came to calories burned. Cracking 4,000 calories every day is a good goal. My schedule is so tight that there isn’t much activity I can add just for the sake of hitting that goal if it’s looking like I won’t make it, but maybe I’ll try adding in some small things, like not using the elevator in my building, and see the kind of difference it makes. Maybe The Rock is right, maybe 14 hours of standing on set is key. I’m getting much better at the food prep. It’s a fairly well-oiled machine at this point. Instead of a focused hour to do it all, I space it out throughout the evening. As my family and I eat dinner, then I give my daughter a bath and put her to bed, there is constantly some rice being made or potatoes in the microwave. Then I do all the portioning in one shot. Each prep is now a full three days worth of food. I still stop at the fish market every two days for my beloved cod (three day old fish sounds terrible), but it’s become much easier to manage overall. Let the daily portioning of the cod begin! My 7-day average for calories burned is awfully close to cracking 4,000 a day. I bet tomorrow it bumps past it. Those numbers both shock and horrify me. Especially the amounts of eggs. I have a fairly meat and egg heavy diet to begin with and have always had excellent blood work. But it would have been great to do ‘before and after’ blood tests, to see what difference it would have made. It’s nothing I’m worried about, but it would have been cool to have some data behind it. It’s Monday, also known as International Chest Day (everyone likes to do chest on Monday’s and apparently The Rock is no exception). I haven’t done workouts that focus just on my chest since my 20’s, so it’s fun to do this for a change. 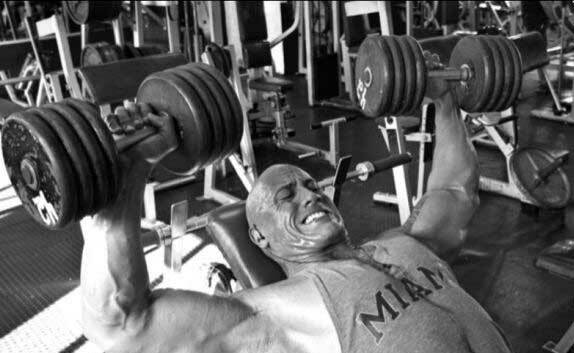 Everyone, including The Rock, does Chest on Monday. The last exercise is what’s called a superset where you do two different moves each set. This one involves doing 15 cable crossovers, then as many dips as you can, for 3 sets total. The dips killed me. I had nothing left by the time I got to them. I was all shaky like when I started doing them for the first time two years ago. Overall, it was a good workout, and I left feeling exhausted yet strong. When I was done, I had the thought: I only have one Chest Day left. It’s crazy to think this challenge is almost done. While I’ll be happy to return a certain sense of normalcy in my life, it’s been a great experience. Having 2-3 hours every morning to yourself to focus on your workout, listen to podcasts and think about your life and direction has been amazing (every parent will especially understand the “time to yourself” part). When I did the reddit post, no one believed I wasn’t gaining any significant weight. On the surface, I find it hard to believe as well. I weighed myself again today. I was 208lbs. Technically I was 206lbs on the very first day of this challenge, but for me, 2lbs of variance is common and happens almost every week. For most of this challenge I’ve been holding steady at 207lbs. The last time I weighed myself was last Monday, when I was also 208lbs. I suspect that extra pound comes from rest day. I’ll try again in 2 days, and I suspect I’ll be back to 207lbs. The most boring chart this month. I messed up the Fitbit dashboard so the fancy graphic for the Weights section is missing, but the activity is captured on my Fitbit profile page. Ah, Sunday. It’s rest day, the only day I don’t have to wake up early to hit the gym. I slept until almost 9am this morning, giving me about 9.5 hours of sleep. My body clearly needed the rest, as I felt great (this is becoming a common feeling on Sundays). Of course, when you’re waking up at a time by which you’ve usually already eaten two meals, there is definitely catching up to do, and you’re running behind all day. I’m actually considering waking up early next Sunday, eating, then going back to bed just so I can stay on schedule. Sunday Brunch: Two Bowls of Mush. As it was, once again, beautifully warm for late-February, the three of us decided to go to the Central Park Zoo. Located three miles from our apartment and with no other plans, we decided to take our time and walk there. I wasn’t sure how long we’d be out of the house, so I brought my next two meals with me. I threw them in the bag along with an ice pack, mentally preparing myself to eat them cold throughout the day. The chicken, fish, and vegetables weren’t bad, but cold white rice is by no means a treat. It’s hard, dry, and generally unpleasant. 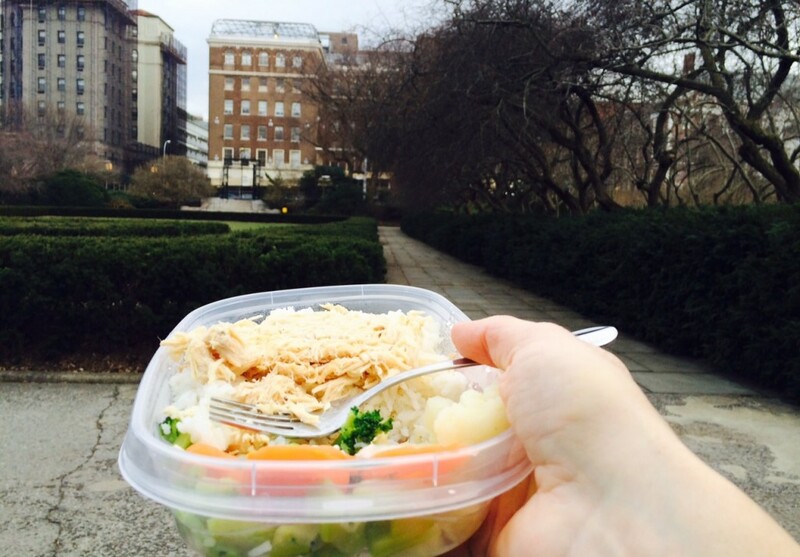 Some cold chicken and rice in the Central Park Conservatory Garden. It was so nice out, my daughter fell asleep in the stroller for over two hours. We never made it to the park, but had a great walk, even better conversation, and terrible meals (for me at least) to show for it. The trip to the Central Park Zoo and back gave me two big walks today. This was my most active Sunday thus far, burning almost 900 calories more than I did a week ago. When you look at the stats below, you can see each walk consumed about 400 calories each, so that makes sense. While the warmer weather is making it easier to be more active, I am glad I decided to do this challenge during the winter. Having to eat these meals while you’re out in the world is a challenge. And during the summer, our family would have probably ended a day like this by eating outside at a local restaurant. Not being able to do that due to this meal plan seems like a bad tradeoff. This is the first Sunday where there are exercise graphs on the bottom. Those two walks seemed substantial enough to include. You can even see a pitstop we took at a playground to let my daughter run around during the first walk! On Saturdays, my wife has started attending a 10:30am yoga class, meaning I need to be home by 10:10am at the latest. Considering my gym opens at 7am on the weekend AND it’s Leg Day (the longest workout), I decided to arrive at the gym several minutes before it opened to ensure I had as much time as possible. Which of course meant that the employee who opens the gym was late by almost 20 minutes. Standing outside the gym like a jerk wasn’t a great way to start a workout that I then needed to rush through. I was also then late coming home, which left my wife to have to rush out the door. Stupid New York Sports Club. 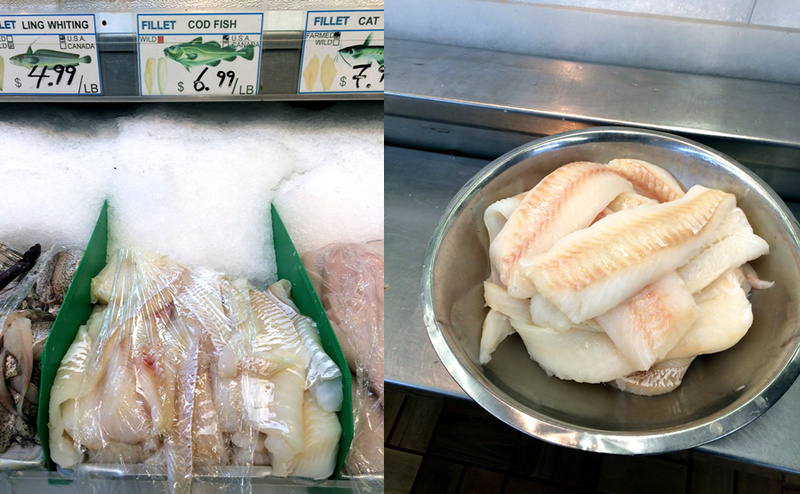 As I do every two days, I made my run to the fish market this evening to stock up on more cod. While I eat more than 2lbs a day, that’s post-cooked weight, so I’m usually purchasing about 6lbs every two days. I guess curiosity finally got the better of the owner of the place, and he asked me “Is this your dinner? You’re here almost every day.” Instead of getting into the whole explanation of what I’m doing, I just said “Yes, I eat a lot of fish.” I imagine him looking at his sales reports next month, and not understanding why his sales of cod has plummeted. 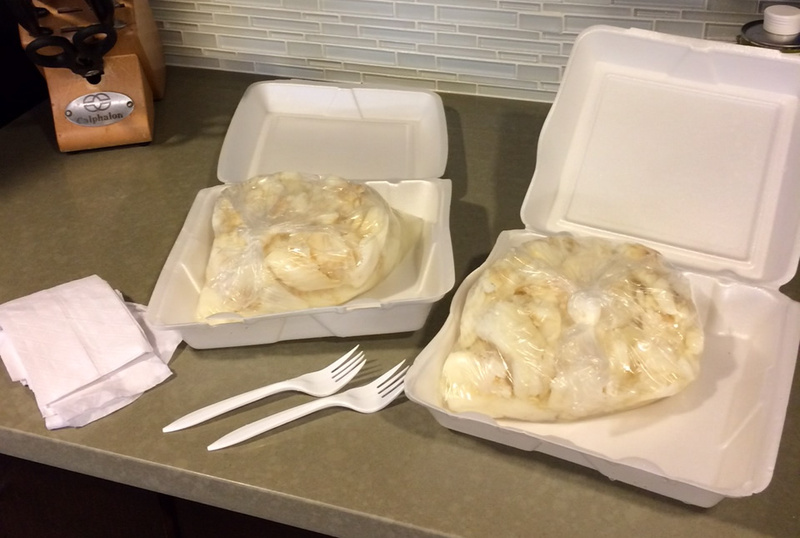 When I got home and started the task of portioning out the fish into containers for each meal, I realized that every time I buy my cod, they put a stack of napkins and two forks into the bag. These guys are thinking that I’m eating 3lbs of plain steamed fish for dinner every night, which seems ridiculous until I realize it’s not that much different from what’s actually happening. Yesterday I burned more calories than I had on any other day all month. Today I beat that number, setting fire to a total of 4646 calories. There were three main reasons for this. The first was that I upped the intensity of my cardio the same way I did yesterday. The second was that it was Leg Day, which is a monster. But perhaps most importantly, I brought my daughter to the playground. It was unseasonably warm in New York today, at one point hitting 61°F. So my daughter and I headed to the park. We played at the playground for awhile, then ran around the lawn chasing birds and squirrels. By not sitting at a desk all day or being homebound by the cold, I was much more active than I’ve typically been this month. Even without huge workouts at the gym, it shows the importance of just getting up and moving. It also made me realize that The Rock probably doesn’t have a calorie surplus on this plan. He’s much bigger than I am, his workouts involve much more weight, and for the remainder of the day he’s likely on his feet. When I can see a warm Saturday reach 4600+ calories burned, you can easily imagine him burning more than 5300/cal a day. In the calories chart, you can clearly see my workout, my trip to the park, then my walk at 7pm to the fish market. Even if you’re not working out like The Rock, stay active. It makes a huge difference. For the most part, my professional life doesn’t require many offsite meetings. I’m working on a few tech startup projects, and most days I’m sitting in front of my computer. I have two business partners I work with typically but during this month, I have been working out a co-working space closer to my apartment (not because of this challenge, it was just good timing). However, today my two partners and I had things to discuss, so I planned to spend my day at their office in Midtown Manhattan. This meant I needed to bring all of my meals with me. So I showed up for the day, sacks of lunches in tow. We spent the entire day in conference rooms. Every two hours or so, I had to excuse myself to go heat up my food and wolf it down. Nothing like stinking up someone else’s office with cod in the microwave for a change. It was a bit awkward and jarring to the flow of the day overall. I wonder if this is what The Rock’s days look like. He’s shooting a movie, and every two hours, inbetween takes he’s shoveling in food. It’s a good thing I don’t have a job in, say, Sales, where I needed to visit customers all day and was forced to eat my cold food in the car. That seems…unpleasant. I’ve been faithfully monitoring all of my workouts with my Fitbit. It’s impossible to know how exactly how accurate it is, but for the heart rate at least, it does match up with the grip monitors on the elliptical, which is encouraging. 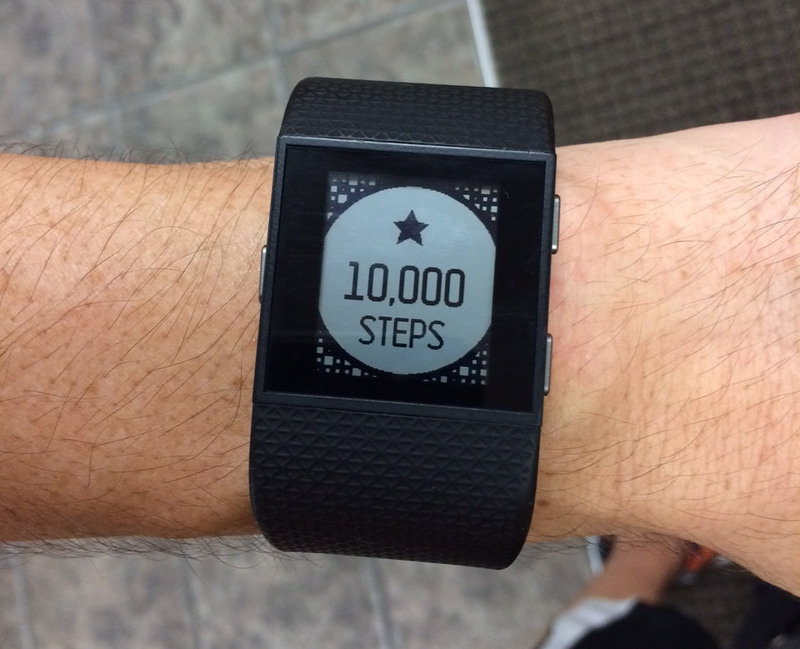 Before this challenge, I had a daily goal of taking 10,000 steps. Now I’m hitting that goal most days while I’m still at the gym in the morning. No amount of Rock’ing will change my petite lady wrists. The good thing about being on this eating plan is I know exactly what I’m putting in my body. When combined with the exertion information from my Fitbit, I’m getting a fairly good measurement on “calories in, calories out.” According to that data, I’m running at a surplus of between 1,000-1500 calories a day. I have yet to gain any weight, which is odd. I have never been a believer that losing and gaining weight is solely a function of calories, and that it is highly dependent on the foods you choose to eat. This challenge is supporting that view so far. If I were eating the same amount of calories at McDonald’s, I’m sure I’d be getting fat. Coincidentally, Morgan Spurlock ate almost the exact same number of calories every day while filming Supersize Me. Of course, he wasn’t working out during that time either. We’ll see what happens during the rest of this challenge, but I predict I won’t gain any significant weight. I gave up on the preset workouts on the Elliptical and just cranked up the intensity. And it worked. I burned more calories today than I have on any other day of the challenge (almost 4,400) and that was mostly driven by the intense cardio. The story was great to read. I thought they did a solid job summarizing what a typical day looks like for me while doing this challenge. I shared this on Facebook and Twitter, which led to a lot of friends, former co-workers, and random people I’ve never met sharing words of encouragement and sharing the story with others. It was very motivating to see the reaction. I have been a fairly active user of reddit for around 8 years. During the past two+ years, as I’ve worked to get myself into shape, I have also been a frequent visitor to the Fitness subreddit. So I decided to continue the fun and post details about what I’m doing on reddit. I’m eating and training like Dwayne “The Rock” Johnson for 30 Days, and just made it half-way through (37/M/6’3”/207lbs). Here’s my lessons learned so far. The reaction blew me away. The post exploded in popularity, and made it to the front page of reddit (no small feat). As the comments poured in, I responded to each and every one of them. Finding myself at the center of a popular discussion within a community I’ve been a part of for so long, I felt a responsibility to be a good citizen and reply to everyone. It took most of my day, but it was worth it. Of course, it also led me to promise that I’d share photos at the end of this challenge. Posting shirtless selfies on the Internet seems like a bad idea, but I’ll figure out something. The vast majority of the responses I’ve received were supportive and encouraging, with a small percentage being typical online haters. 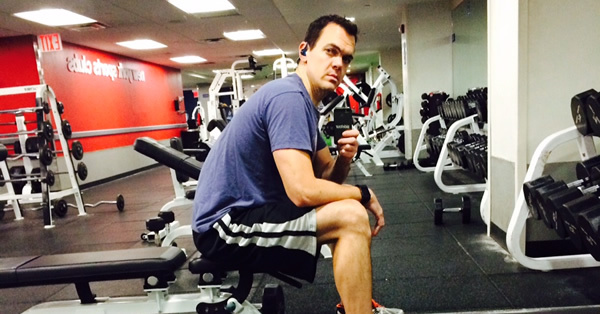 Fitness can be as personal and hotly debated as religion or politics. Many people chimed in with suggestions about what I should be doing instead, and modifications I should make to the workout. I’m not sure the whole idea of the challenge, that I wanted to see if I could do exactly what The Rock does for 30 days, came through to some people. There are people who take differing views on fitness and nutrition as an attack on them personally. I’ll probably do a whole separate post just about this topic once the challenge is over. The elliptical is hard to really get high intensity out of. I’m debating mixing in some running into the cardio. After what was the hardest day so far yesterday, I felt much better when I woke up. I had suspected that it was some sort of food poisoning that made me sick yesterday. This is an especially scary thought because I prepare my food three days at a time, and the day before had been my first day of the new batch. If something had made me sick, it’s conceivable I could be sick the next day as well. But thankfully it seems to have passed. There is nothing like feeling ill to make you really appreciate feeling healthy. So I hit my workouts with a renewed sense of determination. My arms are getting noticeably bigger during this program. Part of this may be due to me not having particularly large arms to begin with. I’ve also never really focused exclusively on my arms in my workouts. Filling out my arms is definitely changing my profile in the mirror. Today in the gym I had an odd moment of feeling disconnected from my reflection, like it wasn’t the body I’m used to seeing. When you’ve been sort of chunky for most of your life, it’s odd to look so different. Granted this is mostly due to my two year journey of getting in better shape, but the fast changes this month are kind of a trip. I don’t know that guy. My wife’s enthusiasm for this project seems to be growing as it goes on. She has thankfully started to take over some of the food prepping, which is the hardest part of this journey. She texted me towards the end of my work day, letting me know she had purchased a bunch of groceries and had started some of the cooking. 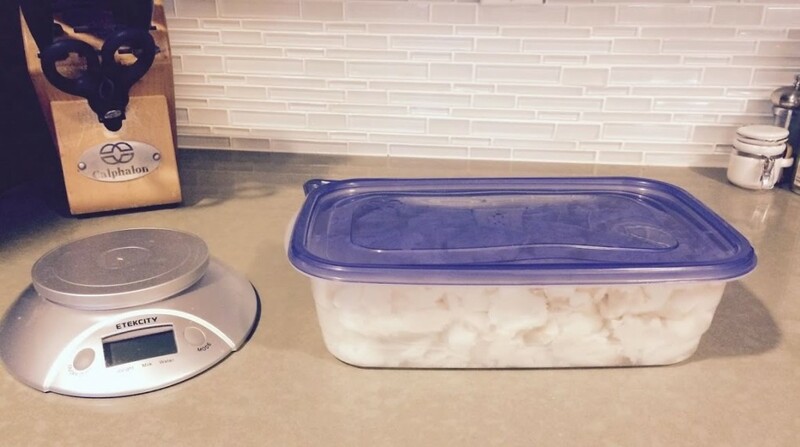 It was a huge help, and I got 18 meals (3 days) prepped and in the fridge before I went to bed. Unfortunately, I got to sleep late, at 11:45pm, which only leaves me about 5 hours of sleep before I do it all again. That’s going to be rough. Staying ahead of my cardio conditioning is hard. This morning’s session didn’t do much. But that spike at 7pm? Wrestling with my two-year old daughter. She’s quite a workout! Today was by far the hardest one I’ve had. This challenge almost beat me. Just as I got cocky yesterday and declared my confidence in being able to complete all 30 days, I woke up this morning not feeling well with what I can only guess was some sort of food poisoning or stomach virus. I’ve eaten the same thing every day for the last two weeks and prepared everything I’ve eaten myself, so this was definitely unexpected. But I felt nauseous, and had a severely upset stomach. Under any other circumstances, I would have definitely skipped working out and gone back to bed. What Are The Rules of This Challenge Anyway? Today was to be Leg Day yet again, which is the hardest workout. 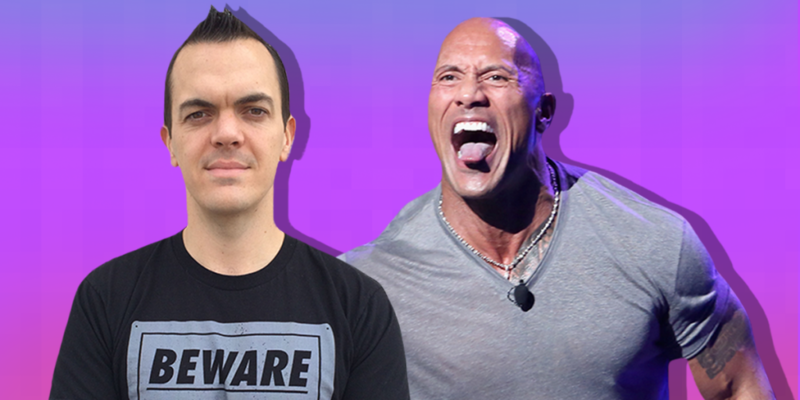 I debated what to do and what fit within the self-defined rules of the Rock’ing Challenge. Could I skip my workout, and make it up on Sunday (rest day)? If I could make it to the gym, was it alright to shuffle around the workouts and instead do Arms, the shortest and least taxing workout? I hadn’t really thought through these sort of tradeoffs when I started, and wasn’t sure what I would consider to fit into the spirit of this challenge. Or was this just me trying to rationalize not pushing myself? The universe did not make it easy. It was pouring rain, making for a terrible walk to the gym. A block from my destination I stepped in a puddle, soaking my toes. This wasn’t going well. My time at the gym started with standing shoeless in the locker room, using the hair dryer to dry my wet socks and sneakers. When things were officially downgraded from wet to just damp, I hopped aboard the elliptical and got to work. Surprisingly, I started to feel better during the cardio. I think just taking my mind off of it helped quite a bit. 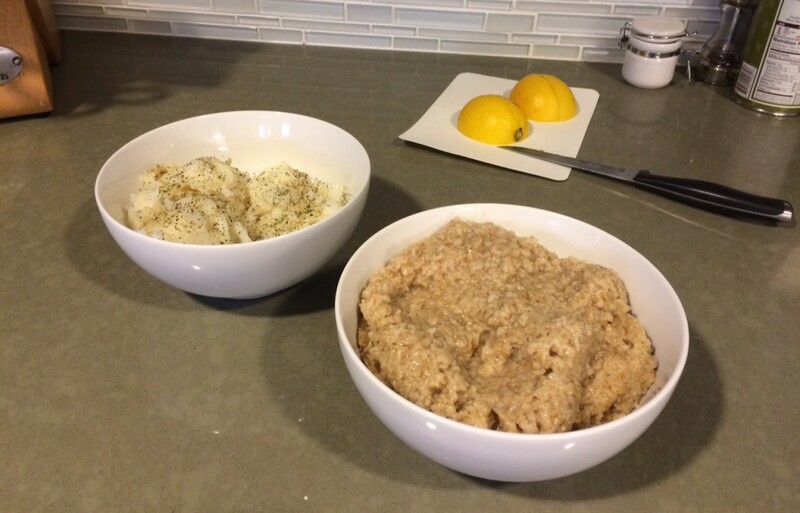 As soon as I done I was still feeling nauseous, a less than perfect condition for having to eat 10oz of cod, 2 hard boiled eggs, and two cups of oatmeal. I normally squeeze two lemon wedges on my cod before I eat it, and it turned out the smell of the fresh lemon actually helped relieve my nausea. So that was helpful. Feeling somewhat better, I started the leg workout. While I didn’t skimp on any weight or effort, I did rest more in-between sets. The weight training took 106 minutes, as opposed to the 82 minutes Leg Day took this past Saturday. That seemed like the right trade-off. By the time I was done, I was exhausted. But I was glad I finished. Under normal circumstances, I wouldn’t suggest you push yourself like this when you aren’t feeling well. Rest is important. But this month is far from what could be considered normal. Would Dwayne “The Rock” Johnson have pushed himself, or would he have let his body rest? In 2013, in the middle of a Wrestlemania match he tore his “abdomen & abductor muscles off the bone.” He went on and finished the entire match, all without telling his wrestling partner John Cena what happened until after it was over. Ouch. 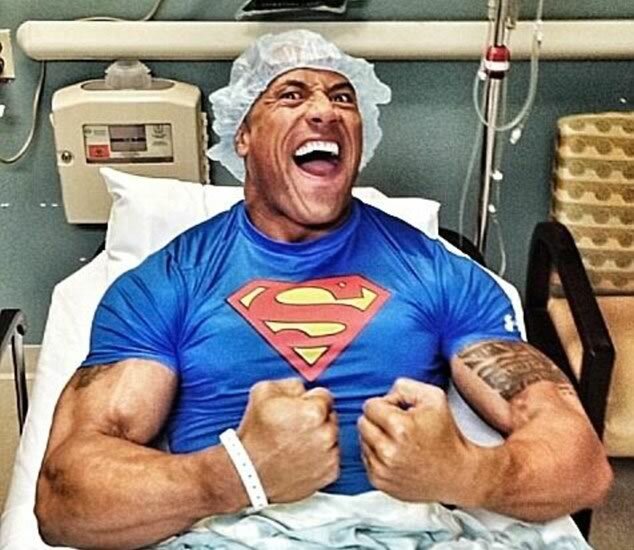 The Rock shared this immediately following emergency hernial surgery. So I don’t think there is a question he wouldn’t have let an upset stomach interrupt his training. 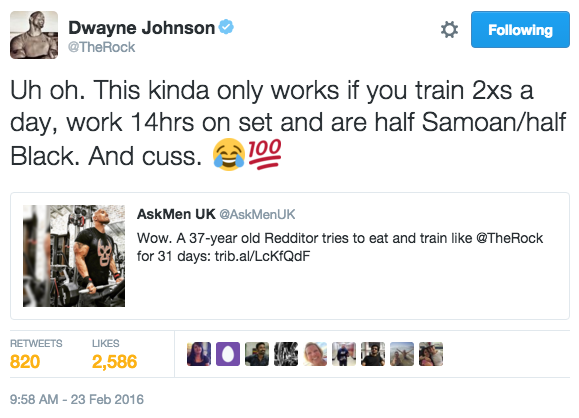 Apparently eating and training like The Rock for 30 Days is nothing compared to actually BEING The Rock. Hopefully just a little of that toughness is wearing off on me. I was so traumatized reliving my workout that I forgot to add the daily stats. Overall a bit down from usual, but that’s to be expected from almost dying. I’m officially at the half-way point of 30 days of eating and training like Dwayne “The Rock” Johnson. When I started this challenge, I questioned whether I would be able to finish it. Part of keeping this blog was to make the journey public, so that I knew if I failed, everyone would know. This is also why I share it on Facebook and Twitter every day, to force me to be disciplined about writing a daily post. When I missed two days of blogging during the first weekend, it was mentioned to me, which was just what I wanted. Since then I haven’t missed one. And I haven’t missed a single meal or workout. I use the same size weights for my workout. I feel my chances of making it through this challenge are fairly good at this point. The two things I worry about are getting an injury, or catching a cold. I’m being fanatical about maintaining good form as I lift, and do a full 10 minutes of foam rolling and stretching every day after my workout so I’m confident I’ll make it through relatively injury-free. The only injury I have sustained so far was during this past week when a wooden chair from Pottery Barn Kids fell on my bare foot at home. It hurt, but I survived. (Being a parent seems to be more dangerous than being The Rock). I will probably never eat cod again after this month. That bowl is two days worth. Since starting this plan 15 days ago, I have gained less than one pound. Considering I’m eating a meal plan for someone who is 6’5″ and 260lbs, this was a huge surprise. I really thought I would put on weight. But I seem to be adding muscle while also getting leaner at the same time. I think by the end of the challenge, the difference will be noticeable enough in a t-shirt that I can spare myself the humiliation of a shirtless selfie. 15 Days down, 15 to go. Let’s do this. Today is a federal holiday. While many of us may have the day off from work, I don’t get a day off from training. So as usual, I was up at 5am and headed to the gym. It was the emptiest I’ve ever seen it. When I showed up, I was the only person in there. Throughout my workout, I saw maybe 4 or 5 other people the entire time. It was fantastic. I had the entire place to myself. 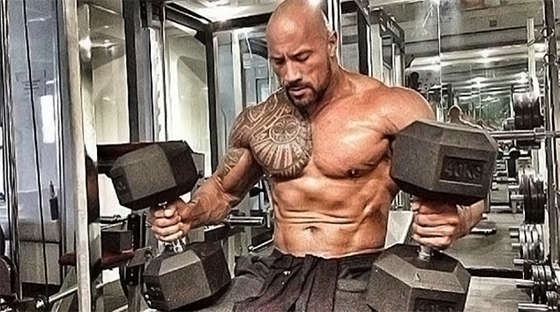 The Rock trains in his own private gym he calls The Iron Paradise. For just this one day, I had my own Iron Paradise, and have officially added “having my own gym” to my list of life goals. Thank You for the Nap, President Washington. While we often refer to today as President’s Day, the actual federal holiday we’re observing is George Washington’s Birthday. The nation’s first President, his list of accomplishments is long. Perhaps his greatest though was giving us this day off so I could take a nap. After working out, I followed my normal routine: come home, shower and get dressed, get my daughter from her crib, get her dressed, then make both of our meals to enjoy together. Today, shortly after eating, I decided to take a nap on the couch. My wife smartly suggested I go to the bedroom, draw the blinds, and take a proper nap, which I did. It was terrific. I slept about 50 minutes, then woke up and had a cup of coffee. Afterwards I was bursting with energy, and my muscles got some much needed rest. I wish I could nap every day. As I had the day off, I decided to go get my haircut. I have gone to the same guy since 1998, which means he’s located no where near where I live. I’m in Harlem, and his shop is in the West Village. I made an appointment for 3:30pm and planned to leave the house around 2:30pm to give myself plenty of time. At around 2:20pm, I realized I needed to eat before I went downtown! If not, I would fall way behind for the day and likely never catch up. I heated up my meal of cod, white rice, and vegetables then proceeded to wolf it down. I didn’t make it out of the house until 2:45pm, and was ten minutes late to the appointment. Afterwards, I had to race back home to make it on time for my next meal. This must be why The Rock has a shaved head: no time for haircuts. It’s hard to keep the cardio intensity going. I’m adapting to the workouts pretty quickly. I think I may need to forget the presets, and just move back to increasing the resistance/incline numbers manually.